In one of the marquee matchups of the weekend, the Carolina Panthers travel to the Motor City to battle the surprising 3-1 Detroit Lions. This one figures to be a grind, with stout and opportunistic defenses on both sides. Fantasy points are going to be tough to come by, and most of the players look like risky plays. At least it should be an entertaining game! 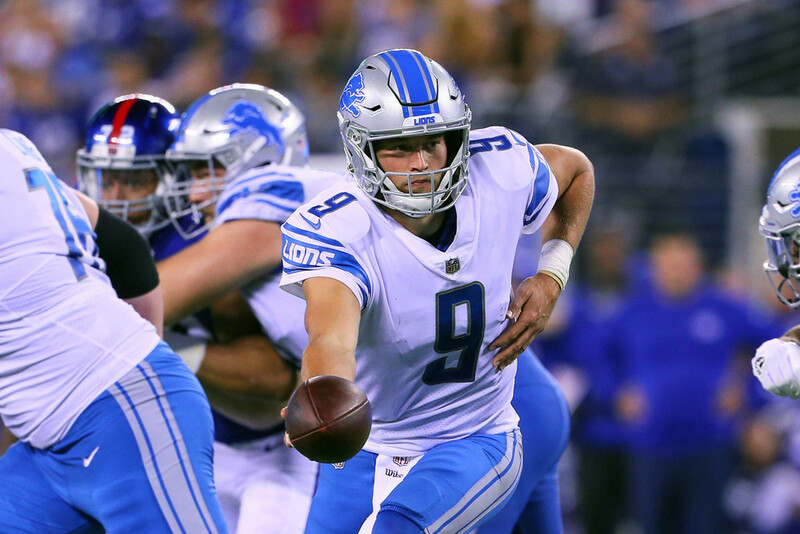 The Lions have played it very conservative two of the past three weeks, relying on their defense, and surprisingly, their run game, to grit out wins. That has had an adverse effect on Matthew Stafford's fantasy output. While Carolina represents another tough defensive test, the team did yield big days to Tom Brady and Drew Brees. The Lions offense isn't as good as those teams, but Stafford should be able to use his short passing offense to put up playable numbers. Consider him a low tier QB1. As the game flow goes, so does Golden Tate's production. In the Lions two shootout games, Tate saw 23 targets, caught 17 balls and scored a touchdown. In their two defensive games, he has seen only 9 targets and made 7 catches. This one looks to be a defensive battle, although Tate should do better than his 29 yards last week. Consider him a low floor WR2. Ameer Abdullah remains right around the top ten in carries, and while his yards per carry remain an uninspiring 3.89, the Lions are committed to the run. With so few volume backs left in the league, Abdullah's floor makes him a must start even in a tough matchup. That being said, he is nursing an ankle injury and missed most of the fourth quarter against the Vikings. Follow the updates carefully. Theo Riddick's usage has continued to drop as the Lions have moved from a spread scheme to more traditional power running scheme. That being said, the Panthers stout front seven may cause the Lions to revert back to more spread concepts to create better matchups. Additionally, James White caught 10 balls last week, something the Lions will definitely note. Riddick remains a risky play, but should be utilized more heavily than in the past. Marvin Jones has only eight catches on the season on 18 targets. Those are not starting fantasy wide receiver numbers in fantasy. He remains a touchdown dependent boom bust play in the Lions offense and should be glued to your bench or the waiver wire. Cam Newton exploded for one of the highest fantasy outputs of the year against a New England defense in disarray. The Lions defense presents a very different challenge. They have been staunch and opportunistic with 11 takeaways on the season. Newton was only averaging 13 fantasy points a week before last week's outburst and figures to be a borderline QB1 with some upside due to his running ability. If you have a better option, use it. Kelvin Benjamin has been up and down so far this year, and hasn't seen the volume of targets (only 13) that a WR1 would expect to see. This week's matchup appears difficult as he draws rising star cornerback Darius Slay. Nursing an injury and facing a tough corner, Benjamin looks like more of a upside flex choice than a WR2. Christian McCaffery continues to see the majority of the running back snaps in the Panthers offense, but remains a one dimensional pass catcher. That means that his output is often going to be determined by the game flow: more catches while they are playing catchup, less when they are ahead. He has been heavily utilized but against a tough Lions defense he is a flex play. McCaffrey has been out-snapping Jonathan Stewart two to one, but Stewart remains the rushing and goal line back, providing him with some fantasy value. Despite the limited snaps, he still ranks 15th in total carries and rushing yards. That being said, the Lions front seven has been good, so Stewart represents a desperation flex, although one that has a higher floor than most. Devin Funchess put together the biggest game of his career last week with seven catches for 70 yards and two touchdowns against the porous Patriots. He continues to see a heavy usage with Greg Olsen out, and has 19 targets in the past two games. With Kelvin Benjamin likely drawing Darius Slay, the Panthers will look Funchess' way often. He projects as a Flex/WR2.